Between 1962 and 1966 Indonesia and Malaysia fought a small, undeclared war which came to involve troops from Australia and Britain. The conflict resulted from a belief by Indonesia's President Sukarno that the creation of the Federation of Malaysia, which became official in September 1963, represented an attempt by Britain to maintain colonial rule behind the cloak of independence granted to its former colonial possessions in south-east Asia. The term "Confrontation" was coined by Indonesia's Foreign Minister, Dr Subandrio, in January 1963, and it has come to refer to Indonesia's efforts at that time to destabilise the new federation, with a view to breaking it up. The actual war began when Indonesia launched a series of cross-border raids into Malaysian territory in early 1963. The antagonism that gave rise to Confrontation was already apparent in December 1962, when a small party of armed insurgents, with Indonesian backing, attempted to seize power in the independent enclave of Brunei, only to be defeated by British troops from Singapore. By early 1963 military activity had increased along the Indonesian side of the border in Borneo, as small parties of armed men began infiltrating Malaysian territory on propaganda and sabotage missions. These cross-border raids, carried out by Indonesian "volunteers", continued throughout 1963; by 1964 Indonesian regular army units had also become involved. At first the Australian government kept its troops from becoming involved in Confrontation, not least because of fears that the conflict would spread to the long - and difficult to defend - border between Papua New Guinea and Indonesia. Requests from both the British and Malaysian governments in 1963-64 for the deployment of Australian troops in Borneo met with refusal, though the Australian government did agree that its troops could be used for the defence of the Malay peninsula against external attack. In the event, such attacks occurred twice, in September and October 1964, when Indonesia launched paratroop and amphibious raids against Labis and Pontian, on the south-western side of the peninsula. Members of the 3rd Battalion, Royal Australian Regiment (3 RAR) were used in clean-up operations against the invading troops. Although these attacks were easily repelled, they did pose a serious risk of escalating the fighting; the Australian government relented in January 1965 and agreed to the deployment of a battalion in Borneo. The first Australian battalion, 3 RAR, arrived in Borneo in March 1965 and served in Sarawak until the end of July. During this time the battalion conducted extensive operations on both sides of the border, were engaged in four major contacts with Indonesian units, and twice suffered casualties from land mines. Its replacement, the 28th Brigade, 4 RAR, also served in Sarawak - from April until August 1966. 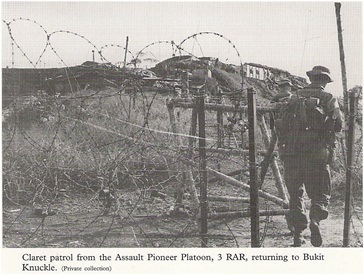 Although it had a less active tour, the 28th Brigade also operated on the Indonesian side of the border and was involved in clashes with Indonesian regulars. Altogether, two squadrons of the Special Air Service, a troop of the Royal Australian Signals , several artillery batteries and parties of the Royal Australian Engineers were involved in Borneo, in addition to the two infantry battalions. Ships of the Royal Australian Navy served in the surrounding waters and several RAAF squadrons were also involved in Confrontation. Continuing negotiations between Indonesia and Malaysia ended the conflict, and the two sides signed a peace treaty in Bangkok in August 1966. Twenty-three Australians were killed during Confrontation across all arms, with seven of them on operations. Because of the sensitivity of the cross-border operations, which remained secret at the time, Confrontation received very little coverage in the Australian press. Most of the Claret patrols did not in fact result in contact with the enemy. One of the characteristics of the Indonesian activity was to maintain a substantial level of harrassment and interdiction fire, mostly from heavy mortors located within tempory positions in Kalimantan. Hi there, I'm a second generation of Kampung Gumbang where Bukit Knuckle located. Please share any photo on this camp during that time.